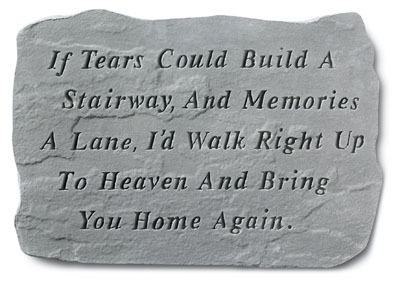 Memorial Stone Large - If Tears Could..
Home > Memorials > Memorial Stones > Memorial Stone Large - If Tears Could.. If tears could build a stairway, and memories a lane, I'd walk right up to heaven and bring you home again. A beautiful large cast stone plaque inscribed with the above message. Crafted of cast stone for a rich texture, it has year round durability. Made in the USA. Weatherproof and guaranteed to last a lifetime. Product details: Crafted of cast stone for a rich texture and year round durability. Made in the USA. Weatherproof and guaranteed to last a lifetime. * Ready to ship in 2-3 business days. Add 1-5 ship days. Photo Memorial Stone What We Have..
* Ready to ship in 3 weeks. Add 1-5 ship days. Photo Memorial Stone Always In our Thoughts..
* Ready to ship in 1 week. Add 1-5 ship days. Credit cards, purchase orders and checks accepted.